Many, many years ago, the local National Public Radio Station (NPR) stopped playing music when anybody was actually listening to the radio. I used to tape random chunks of music, not caring what it was, to take with me on trips because it was so good. When the station stopped broadcasting music when I was awake, and the Internet came along, I turned to NPR’s Web site, its show All Songs Considered, and podcasts to hear interviews with musicians, listen to their music, and find artists I’d never heard before. But, alas, the old NPR site wasn’t much fun to use, especially if you’re on a Mac and don’t care much for RealPlayer or Windows Media. NPR relaunched NPR Music, and I’m in music heaven again. The new site uses a slick Flash pop-up player that’s super-easy to use and, as an added bonus, works across all NPR properties. The free site will feature on-air and online content gathered from NPR and participating stations as well as original content, including interviews, reviews, and live performances. It will cover all the genres found on NPR stations — jazz, folk, world music, rock, and classical. 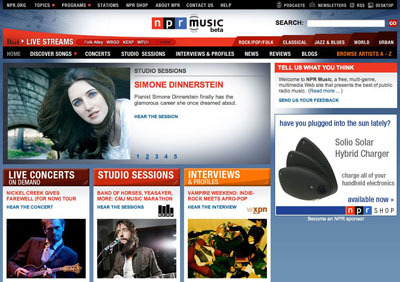 NPR Music is a collaboration between NPR and public radio stations in Seattle, Austin, Newark, Pittsburgh, New York, Boston, Cincinnati, Kent (Ohio), Philadelphia, and American Public Media/Minnesota Public Radio. Through NPR Music I can now browse sections for discovering songs, listen to concerts and studio sessions, read or listen to interviews with the artists, and find news, reviews, and blogs of interest. If you like music, this is a great place to stop, browse, listen, and discover. Best of all, as I troll through NPR Music finding stuff I want to sample, I can create a playlist to listen to all the songs I find. If I’m lazy, I can always sample a wide variety of NPR-built lists for artists like Yo-Yo Ma. To enjoy NPR Music I, of course, have to put up with advertising, but it’s a small price that I will gladly pay. The ads are NPR-style, not your local screaming FM rock station. Now, if I could find a way to download the music and interviews — not just podcasts — to my iPod, I’d really be in music heaven again. Report: music phones spur adoption of mobile music consumption; we say "hogwash"
This is great! I love NPR and their music! Thanks for the great post. Yes, I love NPR also! I am a big fan of NPR music. anyone want to make friends with me? Love the new Site great music player! The relaunch looks great! Nice job NPR making music easy and fun to discover.